In 1954, Marble's® began work on devel­oping and producing the world's first jet pilots survival knife. The first samples were produced by Marble's® and tested by the U.S. Air Force. The unique Marble's® design was purchased by the U.S. Government and 5.000 all blued knives were issued for field testing. The knives were a great success and became the basis for all future pilot knives for every nation in the world. Marble's® actually only produced that one run of knives for the Air Force. The design was put out on bid for future orders and Camillus Cutlery and Ontario Cutlery consistently under bid Marble's® for government contracts. Marble's® really had made literally thou­sands of blades and components before realizing that they would not be given exclusive manufacture. 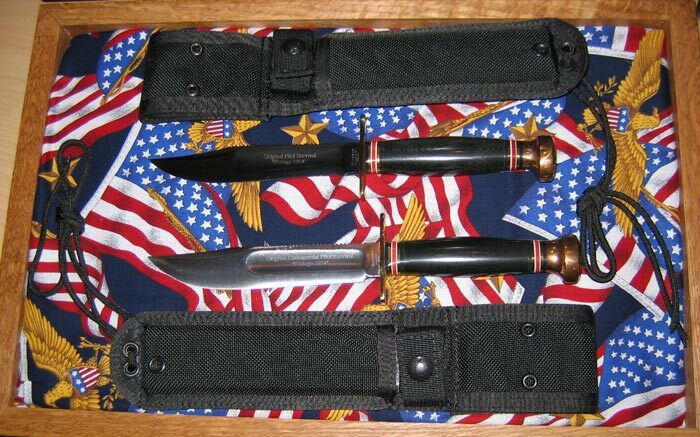 To sell these knives, Marble's offered the "civilian" or "commercial" version of the Pilot Survival Knife to the general*; public. This version had a polished blade, brass guard and polished hex pommel. In 1997, we found a box of original blades. Most were cracked and pitted beyond repair. We were able to salvage about 300 of these vintage blades. We had enough of the origi­nal brass guards and original washers to fin­ish the blades but not enough original stacked leather or hex pommels. We decided to create a couple of new variants. Variation #1 (illustrated) has a blued blade, brass original guard, original washers, black linen Micarta handle and a special red brass pommel. Only 50 of this variation has been made and are specially marked and numbered. It is supplied with a modern "jump safe"-lined Cordura pilots sheath. Variation #3 and #4 have polished blades, original brass guards, original washers, black linen Micarta handles, either brass or custom-made black linen Micarta Pommels. These also use our standard 6-inch brown leather sheath. All of these blades are original forgings from 1954 to 1957. The new variants will be just as collectable as the vintage models because there are only 300 units total. Please ask your local dealer for variants #3 and #4.